Nelsons Revenge is a delicious, full-flavoured premium bitter specially developed by Woodforde's Brewery to celebrate Norfolk's seafaring and maritime past. The pleasing aroma of malt and rich fruit with citrus note make this a Woodforde's classic. The palate is full with malt and fruit dominating initially, but giving way to a lingering dry finish. 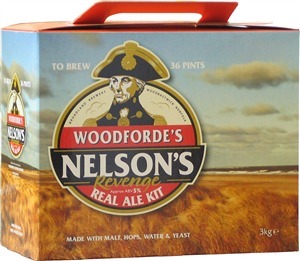 Woodforde's cask conditioned Nelsons Revenge has been recognised by beer experts as a brew which manages to retain the full flavour of malt and hops, yet is not heavy, making it distinctly "quaffable" to the very last. A full-flavoured, premium session bitter.